Housing project becomes the latest among multiple buildings in NYC to use the innovative bathroom pods pre-fabricated off-site to speed and simplify construction while improving safety and offering superior quality. Oldcastle SurePods changes the game with modular construction, eliminating the scheduling and construction hassles of having multiple sub-contractors working in a constrained space. In the same way that many products are made in a controlled factory setting, the 117 fully outfitted and functional Oldcastle SurePods™ bathroom pods installed in New York City’s Prospect Plaza housing project were built for quality and consistency. Replacing traditional bathroom construction, the prefabricated, modular bathrooms deliver better quality, faster construction and easier project management, while simplifying jobsites. Oldcastle SurePods consolidate more than 10 trades – including electrical, plumbing and finishing work – into one prefabricated product. 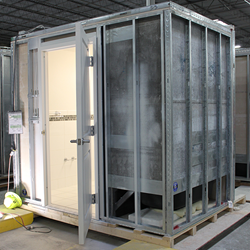 The prefabricated bathrooms are easy to lift, place and install, which helps save project developers time and money. Oldcastle Modular is certificated as an off-site fabricator by the New York City Dept. of Buildings Office of Technical Certification and Research (OTCR). Blue Sea Development – recognized as one of the most innovative and creative developers of social housing – is building the project on behalf of the New York City Housing Authority (NYCHA) and NYC Housing Preservation & Development (HPD). Prospect Plaza is transforming 4.5 acres in Brooklyn’s Oceanhill-Brownsville neighborhoods into 364 housing units, including 80 units of NYCHA public housing and 284 affordable housing apartments, and supporting amenities.